Located northeast of Charlotte, Cabarrus County has been going through an unprecedented growth explosion for nearly a decade and has become a magnet for developers, new businesses, and residents. Easy accessibility has been one of the main reasons for this growth especially with the near completion of the I-485 beltway around Charlotte. The beltway provides easy access to several main highways that cut through Cabarrus County including: Hwy 49, 29, 27 and I-85 which also connects to Highway 73 in northern Cabarrus County. In addition, the Concord Regional Airport, owned by the City of Concord, is located off I-85 and has become the 4th busiest airport in North Carolina. The Charlotte Douglas International Airport is just a short drive to Charlotte and Amtrak has a convenient stop in Kannapolis. 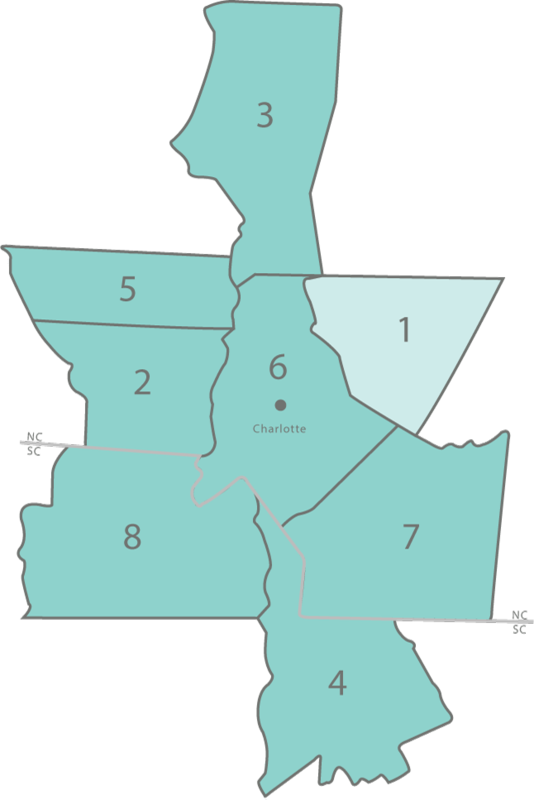 Cabarrus County has over 178,000 residents and includes six incorporated cities and towns: Concord, the county seat, Harrisburg, Kannapolis, Locust, Midland and Mount Pleasant. While the beginnings of the county's wealth stemmed from farming and agriculture, America's first gold was discovered in the late 1700's in Midland at what is now known as Reed Gold Mine, the nation's first authentic gold mine. In the 1830's, it was discovered that the soil in western Cabarrus County was ideal for growing cotton which led to the construction of cotton mills throughout the county. With the inception of the railroad in the mid 1880's, the textile industry exploded in this region and one of the main merchants, James "Jim" W. Cannon, built several giant textile manufacturing plants in the early 1900's including a model mill village which became Kannapolis. The legacy of what Jim Cannon and his son, Charles A. Cannon, created lay the foundation for Cabarrus County's early growth and, while the textile industry is no longer vital part of the local economy in this region, the positive effects of it remain a rich part of the county's history. In addition, while the town of Kannapolis still offers residents small town charm, it has been leading the way in the region with groundbreaking biotechnology, agriculture and nutrition research at its 350-acre North Carolina Research Campus. This county has long been known as "NASCAR Country" and is the center of American motorsports. The Charlotte Motor Speedway, formerly known as Lowe's Motor Speedway, draws hundreds of thousands of fans each year to the NASCAR Sprint Cup Series and NASCAR Nationwide Series races throughout May and October. This track includes the quarter mile long zMax Dragway which is the only 4-lane, all concrete drag strip in the world and is home to NHRA Drag Racing and the Summer Drag and Brag street racing series. In addition, The Dirt Track at Charlotte Motor Speedway, is a state-of-the-art facility with a four-tenths mile red clay oval track and features late model stock cars, World of Outlaws, Spring cards, and monster trucks. There is a second popular but smaller track that also calls Cabarrus County home and it is the Concord Speedway which features quarter and half mile tracks. In addition, there are many professional race shops headquartered in Cabarrus County. In addition to racing, there are many attractions and places of interest in Cabarrus County. Shopping enthusiasts can visit Concord Mills Mall, one of the state's most visited tourist destinations, which has over 200 outlets, specialty shops, restaurants, and a movie theater with 24 screens. Outdoor enthusiasts may enjoy the Bass Pro Shops Outdoor World which is located next door to Concord Mills Mall and features waterfalls, aquariums, trout streams and an indoor shooting range. Also adjoining Concord Mills is the new Sea Life Aquarium, a 36,000 square foot facility with over 5,000 sea creatures. If you want to take a trip back in time, visit historic downtown Concord, which is home to art galleries, museums, antique warehouses, restaurants, a public library, specialty shops, and the beautiful Memorial Gardens that is situated on 3 acres behind the First Presbyterian Church. Or, spend the day at Cannon Village, a restored Colonial-style village offering antique shops, outlets and specialty stores in Kannapolis. For more traditional shopping opportunities, visit Carolina Mall in Concord which offers over 50 shops and restaurants or Afton Village in Concord, a unique mixed-use community of homes and businesses that offers specialty shops, restaurants, outdoor plazas and greens, a YMCA, and 60-acre park system. For those looking for a unique adventure, Great Wolf Lodge in Concord is a great choice and is part of America's largest family of indoor water parks. This 80,000 square foot facility has an amazing variety of activities for people of all agents. Other popular attractions include Rocky River Vineyards in Midland, which is a family-owned and operated vineyard that offers daily tours; Bost Grist Mill, which is located on the banks of Rocky River in Concord, has been operational since the 1800's, offers tours, and continues to serve as a central market place for the region. For sports enthusiasts, Cabarrus County is also home to the Kannapolis Intimidators, a Single A farm team club for the Chicago White Sox, that plays at the Fieldcrest Cannon Stadium in Kannapolis. In addition, Cabarrus County offers a wide variety of parks and greenways and is part of the Carolina Thread Trail. The Cabarrus County School System encompasses all communities within the county with the exception of parts of Kannapolis, which has its own school district. Higher education options include: Barber-Scotia College, Rowan-Cabarrus Community College (branch), and the Cabarrus College of Health and Human Services at Carolinas Medical Center (CMC) Northeast.